The fatty acids in fish oil (such as omega-3) help with a wide range of conditions, with WebMD detailing benefits ranging from improving the health of the heart and circulatory system all the way to fighting dyslexia, kidney disease and improving your child’s IQ. Adding to this already impressive list of benefits, scientists from the Kyoto University found that feeding fish oils to lab mice made them gain considerably less weight than their fish-less counterparts. Their work suggests that fish oil determines the transition of fat-storing cells to fat-burning cells; should the same process occur in humans, fish oil could help us reduce weight gain and counteract the body’s natural loss of fat-burning cells as we age. Most of our fatty tissue’s primary function is to store energy for our other cells to dine on in case food is scarce but it isn’t limited to acting as a pantry. Where white fat cells store fat, brown fat cells are specialized in breaking it down — metabolizing it to keep our body’s temperature stable. These cells are more prevalent in our youth and they make it easier for us to burn through our adipose reserves, but their numbers go down as we age. 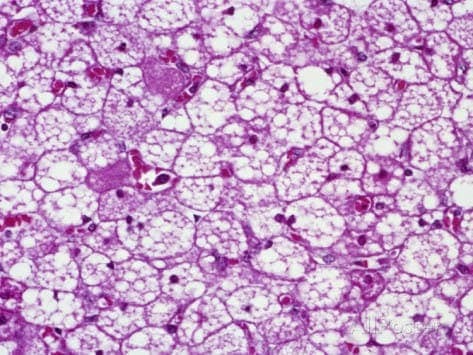 Researchers have also discovered a third type of fat cell they named beige fat cells. They function much like the brown variety of fat cells in both humans and mice, and are also known to become scarcer as we age. And this is where fish oil comes into play. Multilocular or Brown Fat tissue, a special adipose tissue involved in burning fat reserves to maintain body temperature. For the study, the team fed one control group of mice fatty food, and the other with the same diet with fish oil additives mixed in. The results, published in the journal Scientific Reports, detail the weight changes of the animals and show that the group that had fish oil included in their diet gained between 5 to 10 percent less weight in total and 15 to 25 percent less fat. Not bad for a little oil, but why does it happen? Their theory is that the oil activates sympathetic receptors in the digestive system that directs storage cells to metabolize fat. In essence, the fish oil determines the transformation of white cells to beige cells, increasing the rate at which the tissue burns fat and leading to a spike in energy expenditure — and all this energy comes from the white cells, reducing the rate of fat accumulation and ultimately, weight gain. The results of the mice experiments are very encouraging, but right now we don’t really know if the findings also apply to humans. Further studies are needed to determine this, but the team believes that fish oil could become an effective treatment for obesity.